Appointed by the President of the United States, the Attorney General is head of the United States Department of Justice, which was established in 1870 to support the Attorney General. 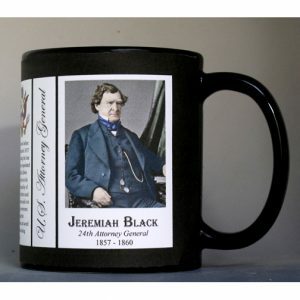 The Jeremiah Black mug is part of a biographical series profiling individuals who served as the U.S. Attorney General. An image of Jeremiah Black and a short biography are features of this history mug.